The "J" and the "M" are my favorites. Wow! Those are super cool!! That is my second favorite. :) I also like the H a lot. All my favorite letters turned out great. It's like they designed these just for YOU! 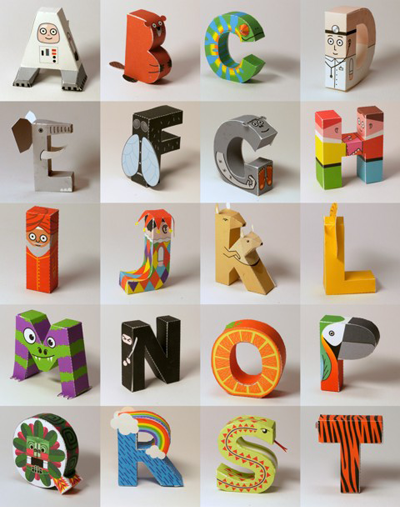 Lovely alphabet. My two favorites: The snake and the orange! Wow. Too much fun. Thanks!! Aw, how cool! I love the P!! These are cool, but I agree about the I - it was the first thing I thought after seeing these. Love these - can you clarify the H though? The designer states, " H is for Handshake. Probably the most abstract of the papercraft letters - the handshake: I only realized after the fact that these guys have but one hand. Well, I think the letter still works as it is, but maybe this is a good candidate for a revised version sometime." great idea - would also be good to have colouring sheet versions to let kids decorate their own!